Invasive seaweeds that have found a foothold in the Gulf of Maine could change the way predators and prey interact. Researchers at UNH’s Center for Coastal and Ocean Mapping (CCOM) have developed a novel method for analyzing the amount of refuge in seaweeds where small aquatic creatures can hide from larger predators. In a recent study published in the Marine Ecology Press Series, researchers used this method to conclude that two invasive seaweeds commonly found in the Gulf of Maine provide more refuge than native kelp for small invertebrates — creatures lacking a spine. These invertebrates take advantage of the invasive seaweed’s bushier, sometimes filamentous blades to hide from predators like fish that can’t squeeze into the seaweed’s tiny nooks and crannies. These findings will help biologists to predict how changes in seaweed habitat affect predator-prey interactions that could then impact the marine food chain. Over the past three years, Colin Ware, director for the UNH Data Visualization Research Laboratory and lead author on the study, worked with students to develop and test the method, called spherical space analysis. Spherical space analysis helps scientists to analyze the structure of a three-dimensional object – in this case, seaweed under water — and then calculate the volume of space between the blades that is inaccessible to predators. Using spherical space analysis, UNH researchers can determine the amount of space in between seaweed branches where small marine creatures can hide from predators. Computer image courtesy of Colin Ware and William Ikedo. Ware collaborated with Jennifer Dijkstra, UNH research assistant professor in the School of Marine Sciences and Ocean Engineering and CCOM, to ensure the method relied on real invertebrate and seaweed samples for accuracy. Spherical space analysis was developed with the help of Dijkstra — a co-author on this study — to expand her existing program of research examining the distribution of seaweeds in the Gulf of Maine and the small creatures inhabiting their spaces, though researchers say the method may have broader applications. “The method developed here could be applied to tree canopies, terrestrial plants, and coral reefs — it’s not limited to just seaweed,” Ware explains. Ware and Dijkstra used spherical space analysis to examine the three-dimensional architecture of two invasive seaweed species — Codium fragile spp. fragile, also known as the oyster thief, and Dasysiphonia japonica, called the siphoned Japan weed — and Gulf of Maine native Saccharina latissima, commonly known as sugar kelp. Unlike kelp with its long flat blades, the siphoned Japan weed and the oyster thief have bushier, sometimes filamentous blades with many branches, perfect for a small worm or skeleton shrimp to hide among and avoid becoming a fish’s next meal. Ware and Dijkstra estimate that for every 100 square meters of the siphoned Japan weed, there could be more than a million invertebrates hiding in the blades, compared to fewer than 30,000 in sugar kelp. 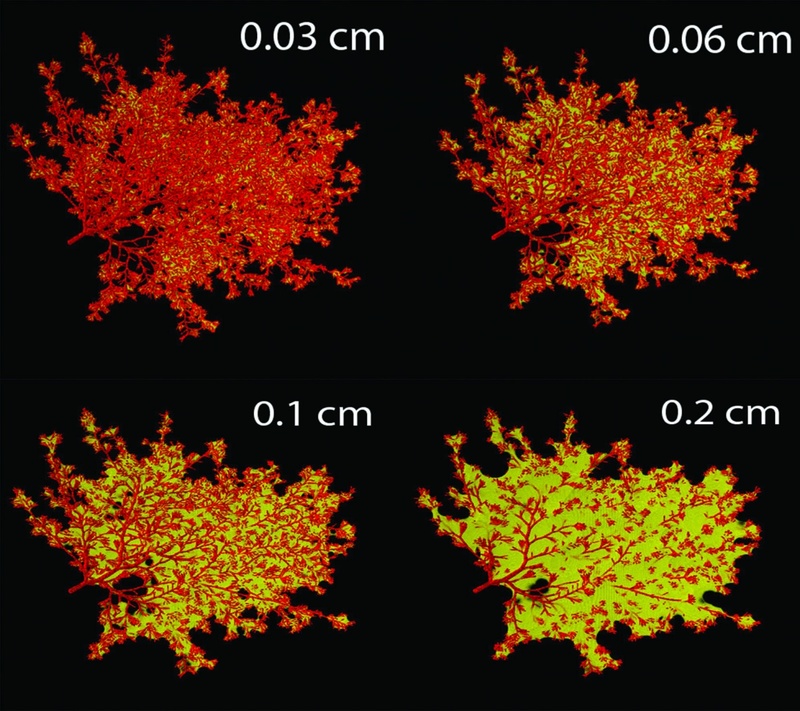 “This is a more complete way of describing the spatial architecture of habitat-forming species, which can then be used to predict ecological interactions in an environment that’s changing,” Dijkstra says. She says it’s too early to tell the full implications of the shift in seaweed composition on predator-prey interactions, but these results along with her previous research points to an overall trend of large-scale changes in the Gulf of Maine. Ware agrees and says the most surprising part of the research is not just the sheer number of invertebrates that can hide in seaweed, but the sweeping nature of the habitat shift that is occurring under the ocean. “The whole ecosystem is changing,” he says. “No one really knows the impact of that just yet, but spherical space analysis can help by showing how changes in seaweed determine the space available for small invertebrates to hide. It can ultimately be used to predict their numbers and be part of larger models of the ocean ecosystems and the food web,” he adds. Funding for this research was provided by the National Oceanic and Atmospheric Administration.